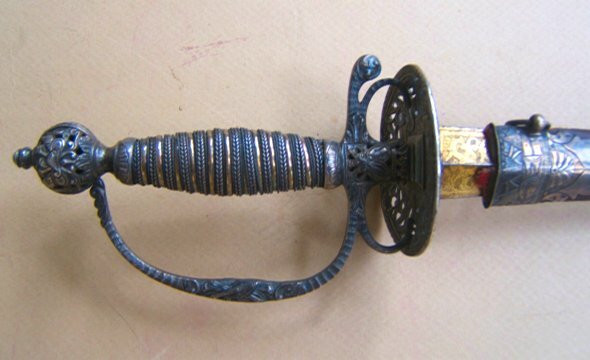 A VERY FINE FRENCH & INDIAN WAR PERIOD ENGLISH SILVER HILT OFFICER’S SMALL SWORD w/ its ORIGINAL SILVER-MOUNTED SCABBARD, ca. 1760: In overall very fine untouched condition with smooth lightly toned surfaces to the diamond-form, engraved, hollow ground, 31 1/4″, colichemard blade with a flared, gold-damascened ricasso (95%+). Very fine surfaces with 95% polish, some light discoloration and a fine tip. 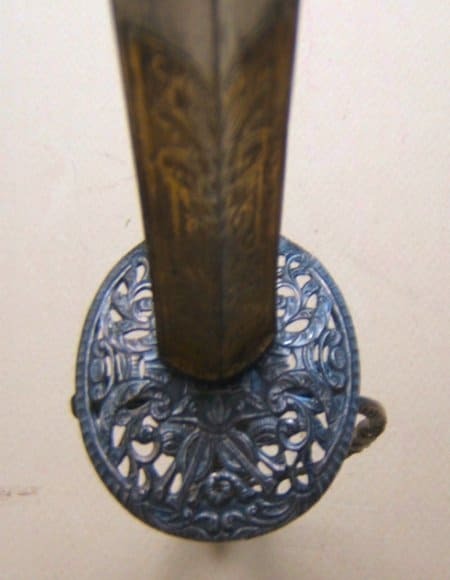 Classic, Georgian Period, cast and richly embossed, Silver hilt of typical Smallsword form with a pierced ball-shaped pommel embossed with rococo accents. The design of a classic mid 18th century martial theme, with raised stands of arms, cannons, trumpets and scrolls. The knuckle-bow with three (3) illegible Hallmarks/makers marks. Finely pierced, embossed and etched, disk-type cross-guard with martial theme decorations and rococo vine-scroll highlights, en suite with the pommel. Retains its original, double, braided-silver-wire grip wrapping and its silver under-grip. In overall very fine untouched condition. The blade with smooth surfaces, 95%+ polish, very light isolated patches of discoloration and a sharp tip: the ricasso with an engraved scallop shell and scroll: 95%+ gilt finish. Untouched hilt with smooth silver surfaces, some light tarnish and its original “peen”. Sharp detail to the high quality, chased and embossed decorations. 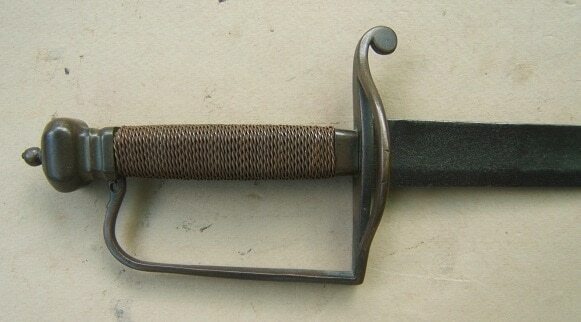 A very fine quality example of French & Indian War Period English Silver Hilt Officer’s Small Sword, ca. 1760. Complete with its original incised and lightly embossed, brown leather, silver mounted scabbard with matching smooth surfaces. The body with some crazing, shrinkage, age-cracks, tears, open seams and missing its last 1/3. Complete with its original, finely embossed and engraved silver mounts, including both of its silver suspension loops: missing its tip. A classic example of a high quality English, Silver-hilt Smallsword, ca. 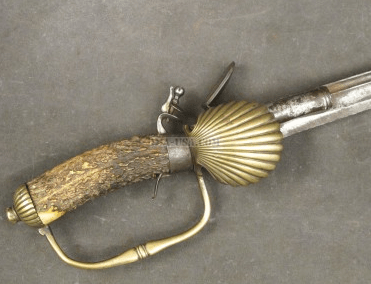 1760 with a gold-damascened colichemard blade and most of its original silver-mounted scabbard. For similar examples please see, G. Neumann: “Battle Weapons…”, pg. 339. Overall length, 38″.